Canine Parvovirus (CPV) is a highly contagious virus affecting dogs. There are 2 types of CPV, one effects the intestines, the other the heart muscles. The intestinal form of CPV is more common, resulting in sickness and diarrhoea (diarrhea). The less common cardiac CPV is only usually seen in puppies and more likely to result in death. Due to the loss of fluids, your dog is very likely to become dehydrated and weak. Cardiac CPV effects young puppies. It attacks the heart muscle and a puppy is likely to die suddenly or after a short period of breathing difficulty. A puppy with cardiac CPV may also show symptoms of intestinal CPV. What are the causes of CPV? The virus is mainly spread by direct contact with an infected dog or indirectly via faecal-oral contact (sniffing or licking contaminated faeces or surfaces). High concentrations of the virus are found in an infected dog’s faeces (feces) and can survive in the environment for up to a year, unaffected by temperature changes and most cleaning products. The virus is easily transmitted from place to place on a dog’s hair or paws, and on shoes or hands. Cardiac CPV affects puppies in the uterus and for up to 8 weeks old. As long as prompt veterinary care is given, survival rates are high, although lower in puppies due to their less developed immunity and higher chance of contracting cardiac CPV and suffering sudden death. Due to the highly infectious nature of the virus, isolation of an infected animal is necessary. Proper, thorough cleaning and disinfection of the contaminated areas where the dog has been must be undertaken to avoid the spread of the virus. The virus is not easily killed but bleach solution (1 part bleach, 30 parts water) is effective, and should be used to clean any surface an infected pet comes into contact with. Certain breeds are more vulnerable to parvovirus, including Doberman Pinschers, German Shepherds, Rottweilers, Pitt Bulls and Labrador Retrievers. Your vet will conduct an examination and ask for a through history of your dog’s health with details of recent activities and symptoms. 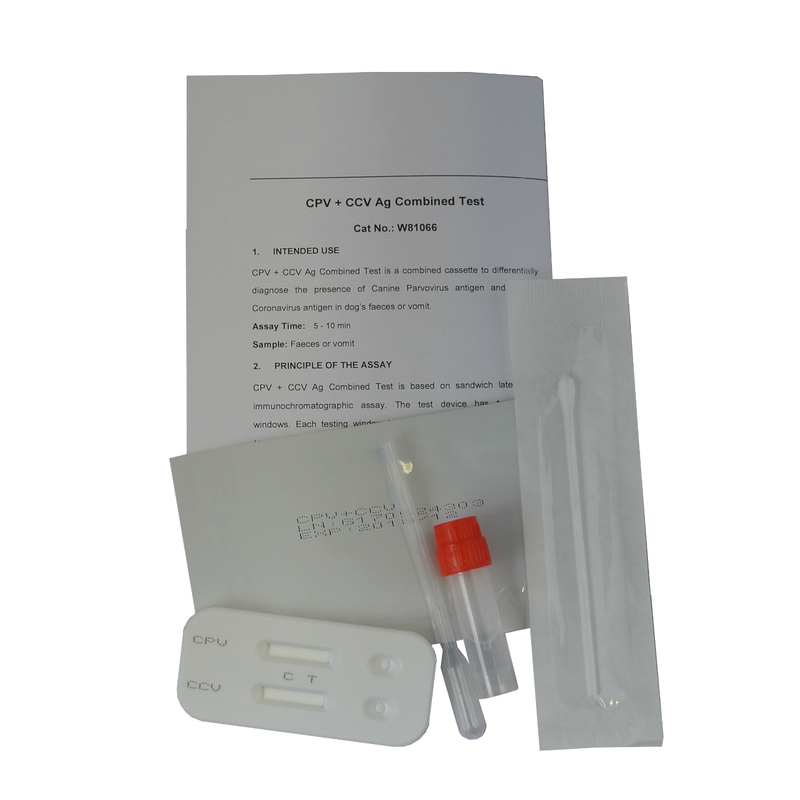 A simple test of faeces or vomit will be undertaken to detect the presence of CPV. Your vet will also want to undertake several other tests such as urine analysis, biochemical tests and possibly xrays and ultra sounds of the abdomen. There is no real cure for CPV, so treatment focuses on elevating symptoms such as nausea and diarrhoea, and preventing secondary infections with antibiotics. If your dog has already suffered sickness and diarrhoea, it is highly likely he will need intravenous fluids and hospitalisation. Even after your dog has recovered from the infection, he will be susceptible to other illnesses. Your vet can advise on ways to boost his immunity and protect him from further infections. Your dog will continue to be contagious for at least 2 months after recovery and so must be isolated for this period. The best prevention against CPV infection is vaccination and good hygiene. Puppies should receive a series of vaccinations starting at 6 weeks (the last one at 14-16 weeks old) and should not be socialised with other dogs until at least 2 weeks after their last vaccination. If you do take your pet to puppy classes, kennels or groomers, be sure to use reputable establishments with high hygiene standards and which asks to see vaccination records. If you have had a dog with parvovirus in your home, you are best advised not to introduce a new puppy or unvaccinated dog within 6 months of your pet’s illness. Adult dog’s vaccinations should be kept up to date with regular boosters.